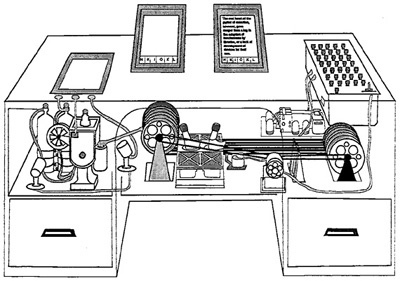 The Memex, as discussed at Eric Blue's Blog. Vannevar. Bush, As We May Think, 1945. "The world has arrived at an age of cheap complex devices of great reliability; and something is bound to come of it." Laurie Anderson, Home of the Brave. Video. Watch from the beginning to 6:00 min. Then Sharkey's Day, from 26:00 - 32:22. And finally, Sharkey's Night from 1:20:55 to the end at 1:30:00. Her earlier work, O Superman, 1981 shows the beginnings of what Anderson is addressing in Home of the Brave: Getting 0 and I closer together. Digital Humanities Manifesto 2.0. Presner, T (UCLA) and Schnapp, J (2009) Have a look at BLAST by comparison, for an earlier sample of aesthetic manifesto. Digital_Humanities, Burdick et al. PDF. Chap 1, hUMANITIeS TO DIGITAL hUMANITIeS, pp 1 - 26. Open access version. It's als in the BSU Library if you're forming a book club and want to read it serially. Richard Lanham, What's Next for Text?. PDF.